I feel flat in the midst of the turning seasons. To naked trees, involuntary contracting of muscle and mind, dark and frosty chill, vacant garden rows and lots and lots of puffer coats; mostly black. So much important work going on under the frozen earth as root systems rest and rebuild and we all hunker down in our dens. My nervous system is tattered from the long summer of tourists standing in their great width and weight, middle of the sidewalk with heads hang-dogged seeking the security of GPS. I am powering down and it feels flat. And turned that beloved face up to me a number of times. She was feeling nervous about various canine appearances along our way. Everything cool? Any need to guard you? I say: ” Hi Em..Everything’s ok. Good dog..very good dog”. My heart slows with the medicine of her pure goodness and beauty. More and more I live inside these seemingly small moments of reverence for life. Or her front leg reach mixed with jangling up and down dancey head movements during dinner preparation. As my heart plumps to bursting I remember these little church moments and take that awareness into the world. That man in Starbucks jumping up from his comfy seat to run across and get the door for me before I even get there…the purity of this act feels the same somehow. 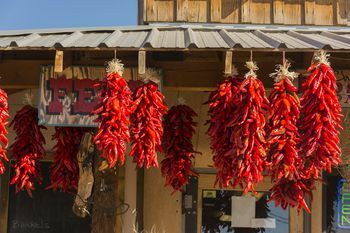 The bright red chile ristras hung recently on the plaza were the essence of red; indescribably deep and rich. The feelings I am after have no names, really. Because reducing them to language is missing the point. Crafting a life of ESSENCE and not EXTRA is what I am up to as we enter this season of excess.. Here is my front porch winter offering inspired by Scandinavia’s inherent appreciation of less-is-way-more.. .
Where would we be without our beloved animals? Their basic goodness and love sustain us. I always have such a sense of pleasure as I read your work. It always inspires and satisfies me. It is like eating a whole pint of ice cream, full of toffee and nuts, standing at the kitchen sink. You always inspire me to do better, my love. Yes, I feel like Jann when I read your eloquent words. Your attentiveness to life and deep appreciation is a constant inspiration. Thank you, dear Cathy. Beautifully written, with touches of humor and great empathy. Puts me right there with you. You always remind me of our humaninity and what’s truly important. It had been a few days since we had heard from you. As others have said, I missed you. Thank you for the inspiration and beauty you send our way. I love discovering the art work you did earlier on in paint, ceramic, etc. which I was not aware of, and now your words full of truthful wisdom and colorful details. What a gift you are.